The government also declassified the transcript of debates during Tuesday’s (31 January) cabinet meeting when the decree that would have shielded dozens of politicians from prosecution was actually approved. It said the decree was a bid to relieve pressure on the prison system but Romanians were furious, holding the biggest mass protests in the country since 1989, when the Communist regime of Nicolae Ceaușescu was ousted in a bloody revolution. 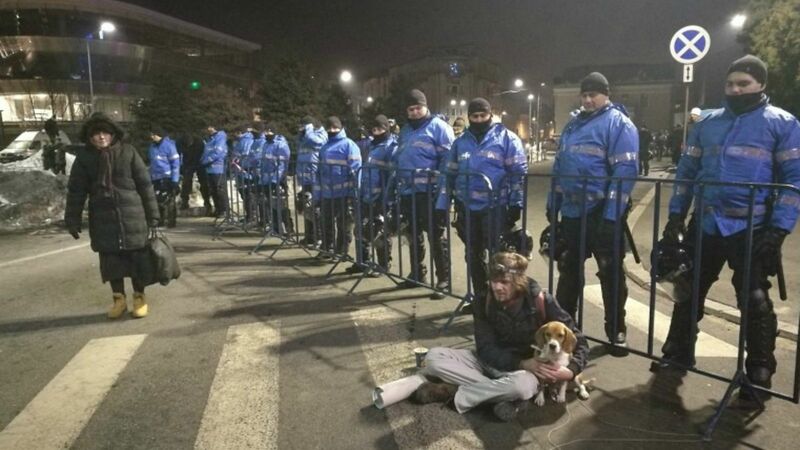 A day after Prime Minister Sorin Grindeanu said he did not want to divide Romania, his cabinet held an emergency meeting to scrap the decree as tens of thousands of demonstrators outside chanted “Thieves, thieves” and “Re-sig-na-tion, Re-sig-na-tion”. Among the 220,000 protesters in the central Piata Victoriei square, one dressed as 15th century Romanian ruler Vlad Țepeș – notorious for impaling Turks and thieves on wooden stakes and whose life inspired the fictional character Dracula – held a banner reading: “Did you miss me?”. A giant laser plastered the words “Do Not Give Up” and “Resignation,” on the facade of the building housing the headquarters of government and the prime minister’s office. 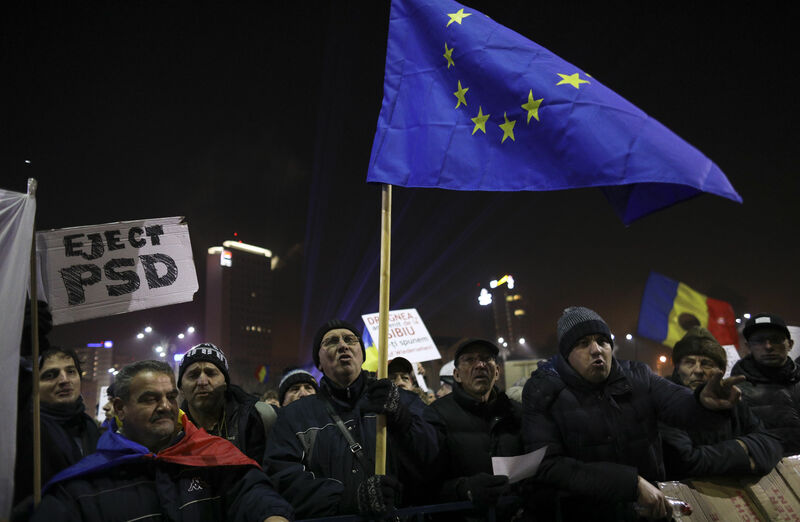 The decree had been seen by critics as the biggest retreat on reforms since Romania joined the European Union in 2007. It would have exempted abuse-of-power offences involving sums below 200,000 lei (€44,000) from prosecution – shielding hundreds of officials from justice. 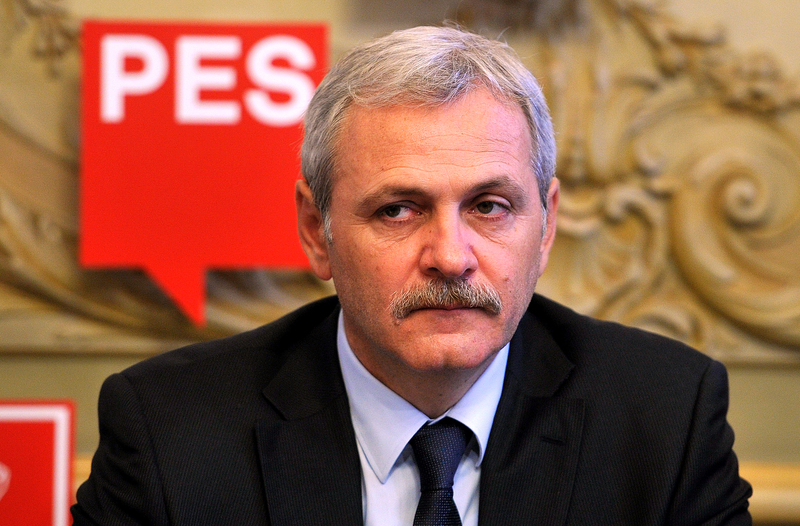 Liviu Dragnea, leader of the ruling Social Democrat party, said the prime minister would hold talks with his justice minister and decide whether or not to sack him. The decree could have put an end to the trial of Dragnea, who is barred from political office because of an electoral fraud conviction and viewed by many as the real power behind Grindeanu’s government. Romania’s regional development minister was convicted today (15 May) of masterminding a campaign to use bribes and forged ballot papers to swing an impeachment vote against the former president Traian B?sescu in 2012. Among the decree’s chief critics was President Klaus Iohannis, who joined one anti-corruption rally two weeks ago and repeatedly urged the government to scrap the measure. On Sunday a small group of pro-government protesters in front of his presidential palace denounced him as a “traitor”. Germany and the United States were among nine western powers that had expressed concern that the decree could undermine Romania’s partnerships in the EU and NATO. I’m doing truly well with Emini S&P trading. I am utilizing this Emini S&P Trading Secret, these fellows are better than average. They have this every day record of their trades in Youtube. Pretty genuine for me. Heartwarming to see that the Romanian people are so determined to not allow the country to slip back into nepotism and clientialism. There is certainly more work to do, we will probably have to wait for the next generation before the Romanian politicians truly give up on the old ways. But the path is set. The only of the former soviet block countries that worries me, is honestly Hungary, since there doesn’t seem to be serious political opposition in the country. Poland might be in a bad place currently, but its people and the political opposition are going to fight Law and Order every step of the way. There is no way they are going to replicate Orbán. In any case, best wishes form Denmark. One way to earn money nowadays it through Code Trading System, to learn the strategies and to be successful in trading just Google Code Trading System.